FelonSpy is a satirical website that emulates sites such as CriminalSearches. The site purports to find which of your neighbours has a criminal record. 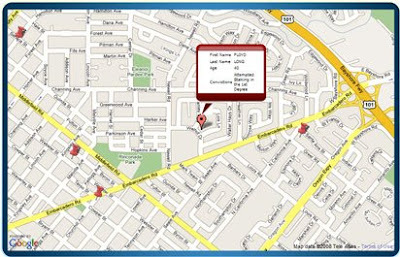 Users enter their address and FelonSpy tags supposed criminals who live near by. The site is very well done and certainly had me fooled (the comments below reflect my initial gullibility). If you read the text on the home page and in the disclaimer it soon becomes clear that FelonSpy may just be pulling our legs. Ucrime provides crime maps for all the major US universities. Each university can be selected from a drop down list. UCrime then shows a map of the university and surrounding area with all the recent crimes tagged. You can filter the results by time period or by type of crime. All the crimes are tagged on a Google Map and appear in a list under the map. Clicking on a tag reveals more information about the individual crime. Registered users can even report a crime and UCrime will add it to the map. I entered my address (in zip 20746) into FelonSpy. The result included 3 hits in a nearby cemetery, three in a federal complex next to the cemetery with offices for the National Archives, Bureau of the Census, and Navy Intelligence, and one hit in the nearby Smithsonian warehouse complex. None of those seven came up at CriminalSearches. On the other hand, CriminalSearches found two nearby drug dealers missed by FelonSpy. Makes me wonder about the accuracy and completeness of both sites. FelonSpy is a hoax website. It just randomly generates names and crimes and puts them anywhere on the map. This was great. I laughed out loud reading the felonspy.com Terms and Conditions. The Disclaimer is also excellent.